MSC's earnings were disappointing from an end-market perspective, but the company is managing costs better than expected. The latest third-quarter results from MSC Industrial Direct (NYSE:MSM) confirmed the company's position as a potential recovery play, but it also underlined how difficult its end markets are at present. In short, it was a mixed bag of results. Let's take a closer look at the good and bad in the quarter. Followers of the company will know that its management is partaking in a long-term growth strategy of consolidating a fragmented Maintenance, Repair and Operations, or MRO, market in the U.S. However, this requires investment in growth programs (acquisitions, technology investments, e-commerce expansion, etc.) 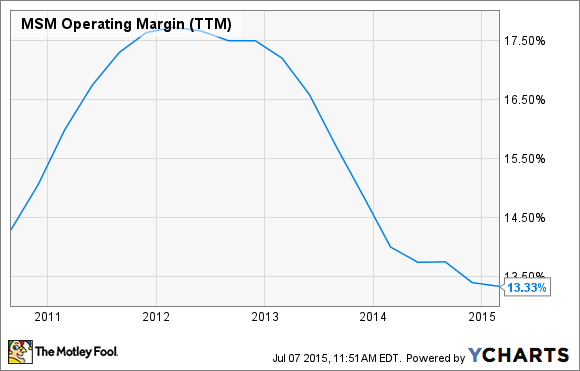 in order to scale up operations -- something that has proved a drag on margins in the last few years. The shift to large account growth is partly a consequence of MSC's plan to scale up to service large customers, but it's also reflective of the lack of confidence among small businesses in the U.S. In addition, despite some evidence of perking up in the Institute for Supply Management, or ISM, Purchasing Managers Index in recent months, there was little sign of it in MSC's numbers. As you can see in the chart below, the ISM index has been stronger in recent months. However, MSC's average daily sales to manufacturing customers grew just 1.2% on a yearly basis in the third quarter compared to a 10.1% increase from its nonmanufacturing customers. 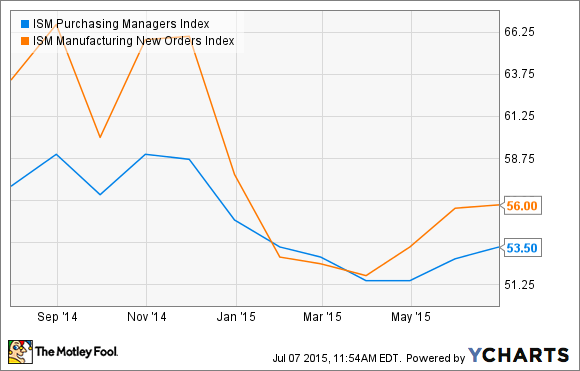 This matters because manufacturing customers made up 70% of its customer sales in the first three quarters of 2015. As such, total company net sales in the third quarter were only up 3.5% on an average daily sales basis compared to the same quarter last year. On a more positive note, earnings came in ahead of company guidance, with EPS of $1.03 compared to previous guidance of $0.95 to $0.99. Based on a diluted share count of around 61.4 million shares, the previous guidance suggested a net income range of $58.4 million to $60.8 million, when net income in the quarter came in at $63.3 million. In the earnings release, Gershwind outlined the reasons MSC outgrew its end markets: "We did, however, see growth well above the market driven by continued traction from our share gain programs as customers increasingly leverage our supply chain solutions." And CFO Jeff Kaczka discussed the "prompt actions that we took to manage our operating expenses. We achieved operating expenses as a percent of sales at the same level as the year-ago quarter, even though sales growth was only low single-digits and we increased our investment spending." It was definitely a mixed report for MSC Industrial. Unfortunately, end market conditions haven't picked up yet, but the company is doing better than expected in managing its cost base at a time when it's scaling up operations. In other words, if and when the industrial sector turns back up again, then MSC Industrial could see the benefit of increased profits due to margin expansion. On a less positive note, the guidance for EPS of $0.93-$0.97 in the fourth quarter is below analyst estimates for $0.99 and indicates that MSC Industrial still operates in challenging end markets, even as its management aims for long-term industry consolidation.